Thursday night: Mostly clear and comfy. Low to mid 50s. Friday: Mostly sunny and warm. Upper 80s to near 90. Cooler 70s Cape. Breezy SW wind. Saturday: Warm & humid. Mid/late PM storms. Upper 80s drop to the mid-70s late. A new, dry air has taken hold of most of New England Thursday, and with an onshore wind, temperatures at the coast remain coolest with highs in the 60s as opposed to 70s inland. Partly cloudy skies overnight come as warmer air begins moving in with an increasing southwest breeze, but the warmth really becomes apparent Friday, when sunshine, mixed only with some afternoon wispy clouds, pushes temperatures to nearly 90 degrees. Cooler air never seems to be far away in this weather pattern, and the edge of our New England warmth will start to erode in northern Maine Friday afternoon, sparking scattered strong thunderstorms in the Crown of Maine Friday. 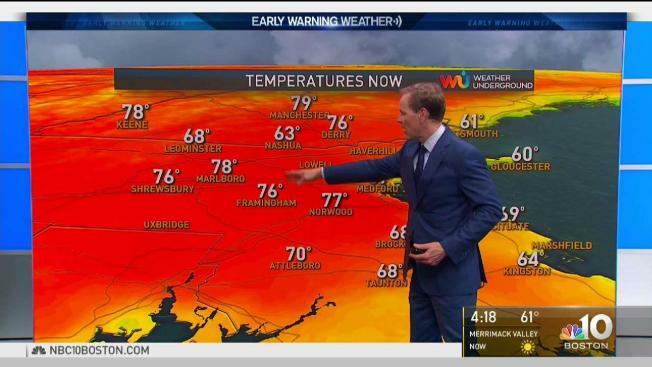 By Saturday, the front edge of colder air — referred to as a cold front — will be sinking slowly south, meaning scattered showers and thunder will develop for more of New England, fuelled by an increasingly humid and continued warm summer-like air. The approaching cold front swings through Saturday night, ushering in cooler air Sunday with a wind off the ocean that will mean plenty of clouds and some showers, particularly in the morning. 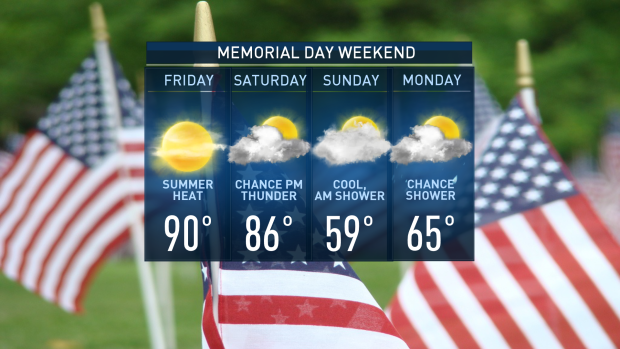 A continued onshore, cool wind flow will persist into Memorial Day, ensuring cool air holds on, but there’s the hope that enough dry air moves south from Canada to erode some of the showers, at least allowing them to be scattered and more infrequent Monday, providing some dry periods for Memorial Day observances. The rest of next week looks mild in our exclusive Early Warning Weather 10-day.